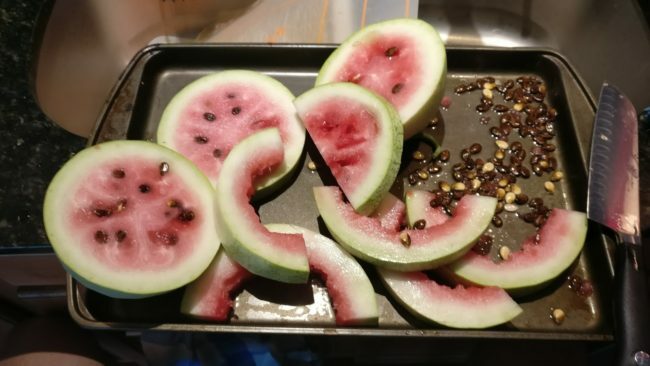 I love Watermelon, but I cannot say the feeling has been mutual over the years. I grew it semi-successfully in Houston with the little-known variety Mickey Lee (sometimes Mickeylee). 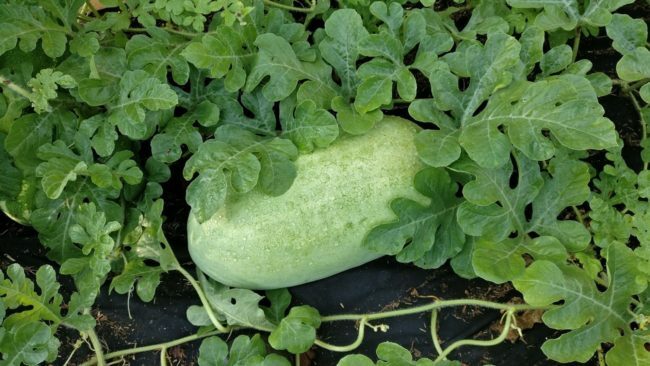 Watermelons normally grow on 15-20 foot roving vines that gobble up yard space with a vengeance. 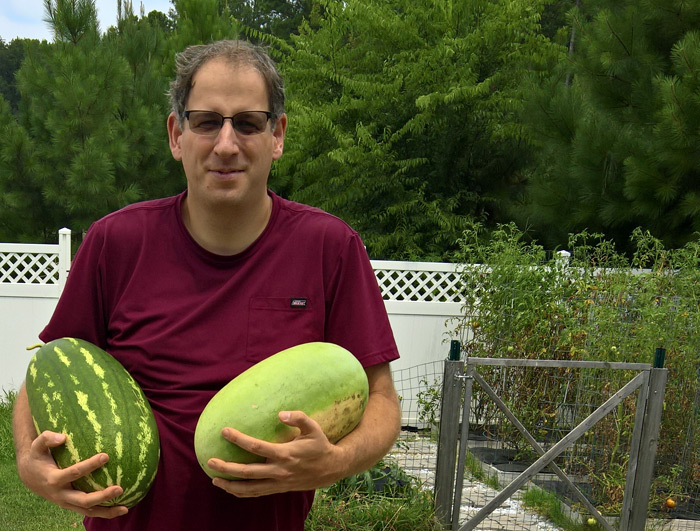 Assuming soil conditions are perfect, they reward you with sometimes mammoth melons of 50 or more pounds. 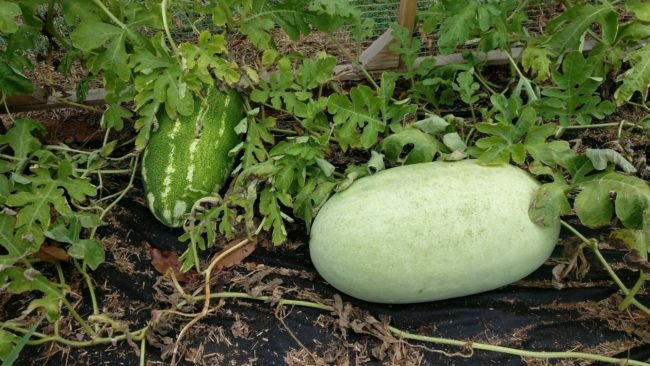 What appealed to me about Mickeylee was the somewhat compact growth habit (10-12 foot vines) and the personal sized melons it produced so many of. This year I gave serious thought and effort towards getting melon poundage I’d be proud of. I planted two varieties — All Sweet and Charleston Grey at two locations. Here and at a friend’s place where we co-garden. 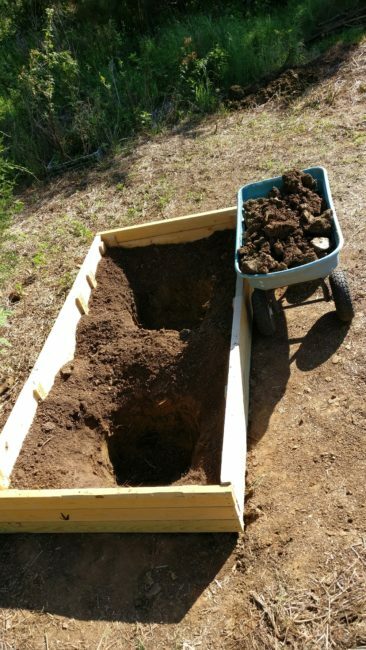 I spent hours on soil prep here based on the best advice I could find which suggested a 3 foot hole deep filled with peat moss, composted cow manure, and finely textured soil. At my friend’s house, I simply tilled his red clay dirt and gingerly transplanted a couple of week-old seedlings. The universe has a sense of humor, so I don’t have to tell you which site produced excellent results and which one a steady stream of disappointment. 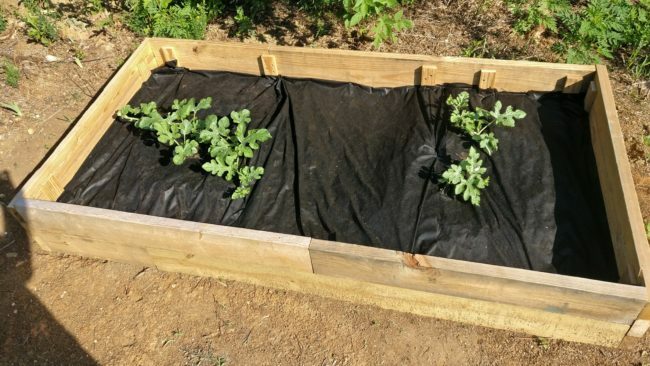 My meticulously prepared, amended, and planted watermelon bed. 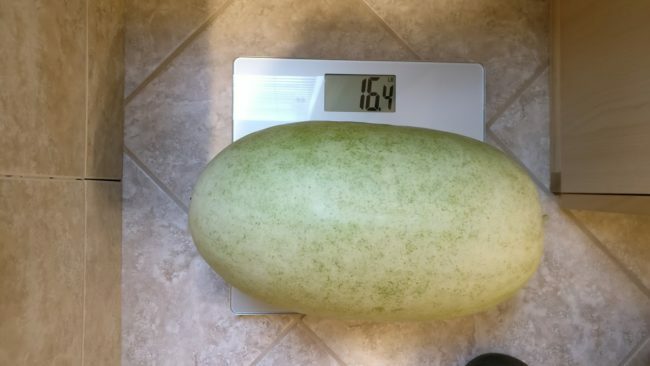 However the largest melon above was delicious when I cut it up. It was only bad near the BER. That’s pounds by the way. 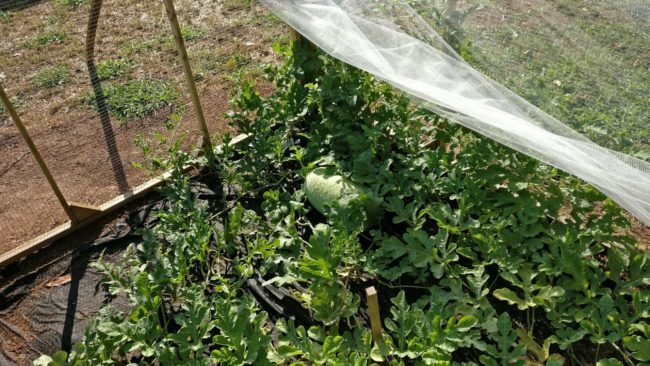 The curly tendril nearest the melon turns brown and shrivels up. The fruit’s skin goes from a shiny finish to more of a dull shine. You can no longer dig your fingernail into the rind. 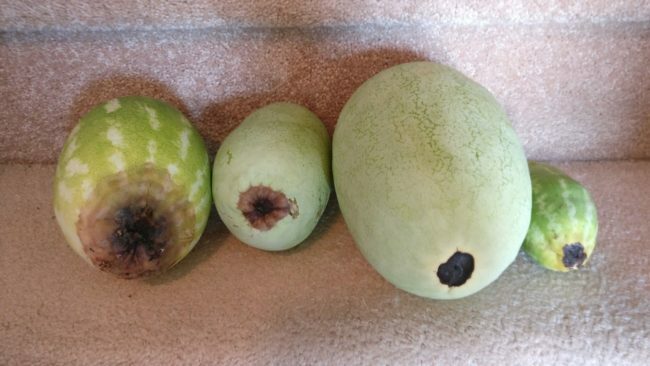 A creamy yellow spot develops on the bottom of the melon where it was touching the ground. The thump test. If you rap your knuckle on the side of the melon, it will have a dull low thump when it’s ready. An unripe fruit will have a sharp high ring when it’s still maturing. 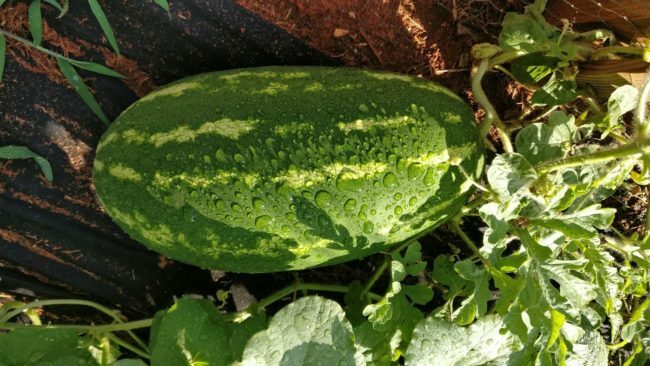 Knowing when watermelons are ready may not require psychic powers, but it helps. 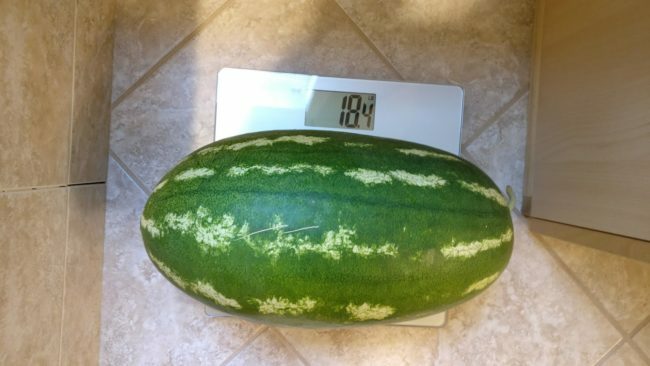 What to Do with all that Watermelon? 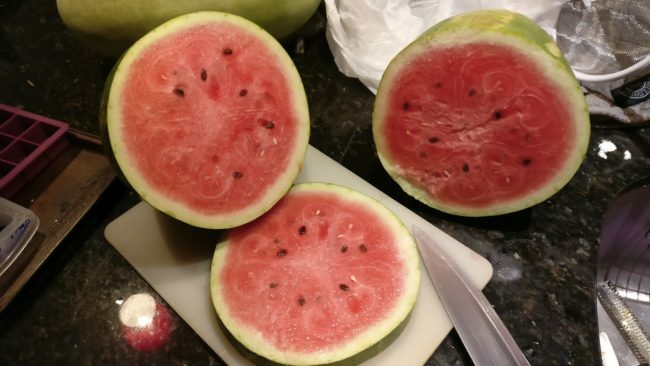 The best part about fresh watermelon from the garden? After you’ve eaten and shared all you can there’s still a use for the rest of it. 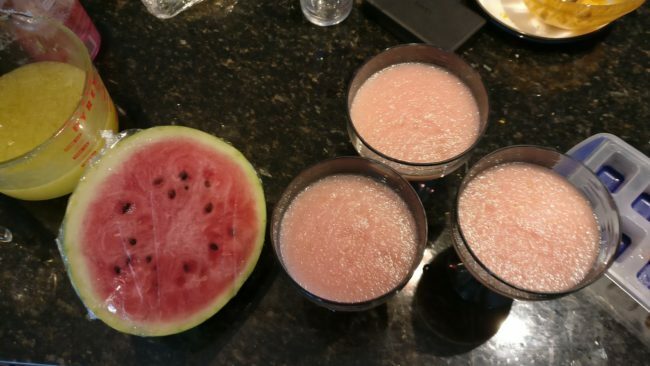 Watermelon margaritas! 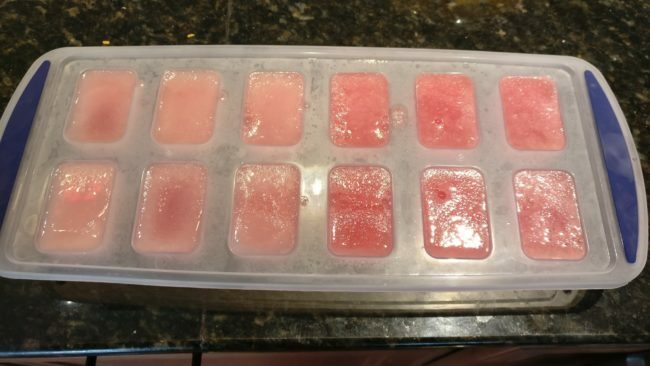 The strained watermelon juice goes into ice cube trays and will freeze overnight. 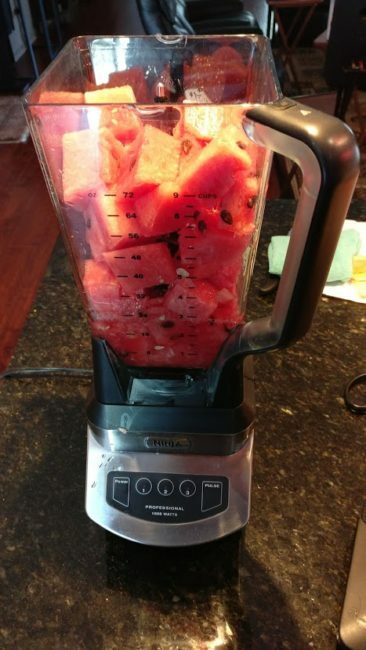 What’s a decent Blender? Ninja, KitchenAid, BlendTec, or Vitamix. 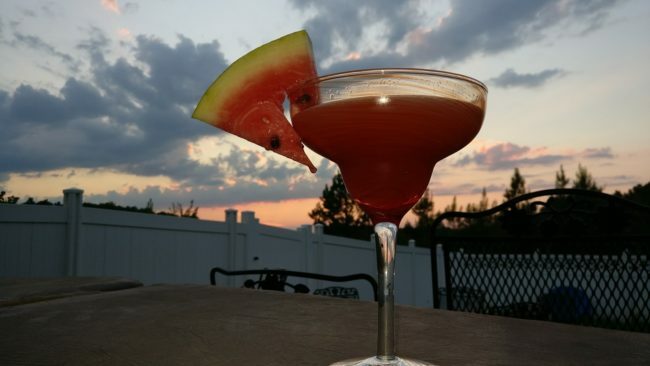 The watermelon is not overpowering but you can definitely taste it. You can make other variations as well. A pitcher of standard lime margaritas has four cups of ice. A pitcher of strawberry margaritas has two cups of ice and two cups of store-bought frozen strawberries. Zest the peel from several limes and 1 lemon to produce about 3 tablespoons of zest. Juice 12-15 limes and 1 lemon. Measure lime/lemon juice and then add same amount of sugar to a measuring cup. If you get 3 cups (24 oz) of juice, add 3 cups (24 oz) of white sugar. Add just enough boiling water (3/4 cup?) to sugar to moisten it and whisk vigorously until sugar water is translucent. Stir in lime and lemon juice and whisk until combined. Cover measuring cup with plastic wrap and allow to steep in fridge overnight.